Oil on panel, 9"x12". Standing in one place on the rim of the Grand Canyon for hours at a time is something that not many people get a chance to do. It is magical to see the Canyon's shadows and colors change constantly. We find ourselves, as painters, trying to capture the moment before it is gone. I am in awe of how atmosphere changes the color of the earth and the stratified layers of the Grand Canyon show this like no other place on Earth. 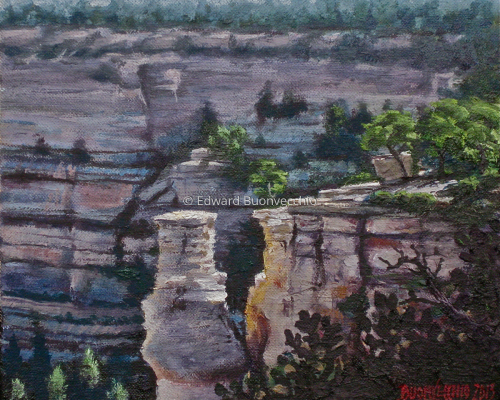 My series of South Rim plein air oil paintings show this as best I can paint. 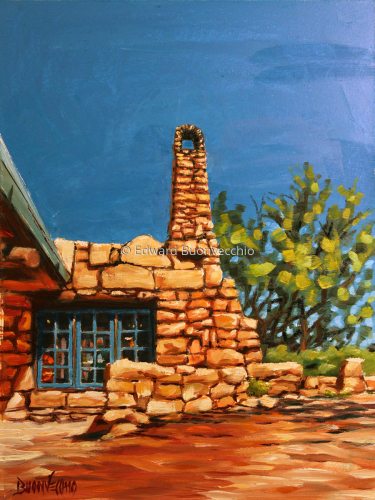 This series was painted in September of 2012 during a workshop with Linda Glover Gootch given through the Scottsdale Artists School and the Grand Canyon Field Institute. Oil on panel, 9"x12". 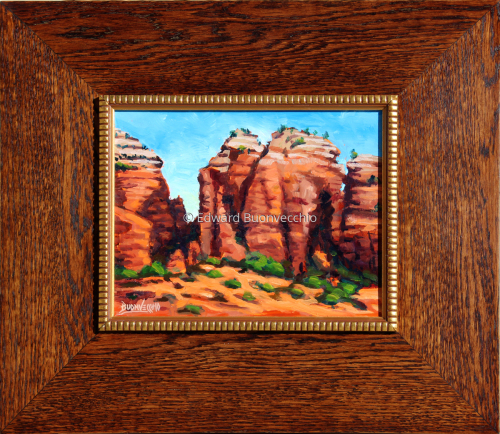 One hot afternoon in Sedona i hiked in with my French easel to paint one of my favorites sites in Arizona. The color of the rock and the deep red shadows against the blue of the sky made me crave to be on top of one of those spires. This is a striking view of the Colorado way down below. I am in awe of how atmosphere changes the color of the earth. The stratified layers of the Grand Canyon show this like no other place on Earth. 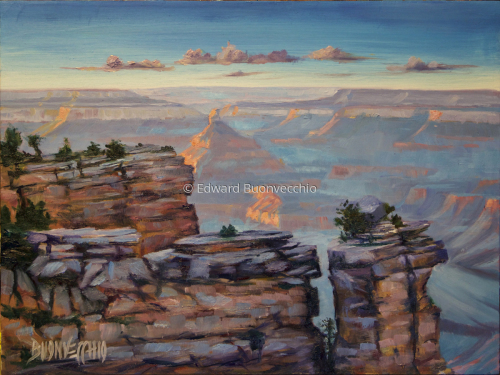 My series of South Rim plein air oil paintings show this as best I can paint. 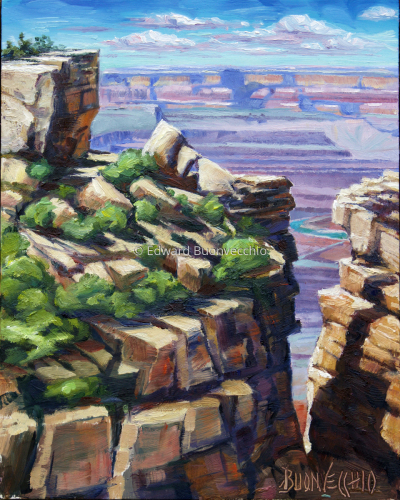 This series was painted in September of 2012 during a workshop with Linda Glover Gootch given through the Scottsdale Artists School and the Grand Canyon Field Institute. Oil on panel, 9"x12". The shadows get deeper and deeper and the peaks get brighter and more golden as the sun gets lower and lower. Standing in one place on the rim of the Grand Canyon for hours at a time is something that not many people get a chance to do. It is magical to see the Canyon's shadows and colors change constantly. We find ourselves, as painters, trying to capture the moment before it is gone. I am in awe of how atmosphere changes the color of the earth. The stratified layers of the Grand Canyon show this like no other place on Earth. 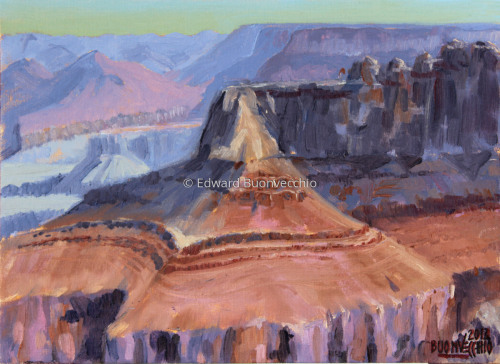 My series of South Rim plein air oil paintings show this as best I can paint. 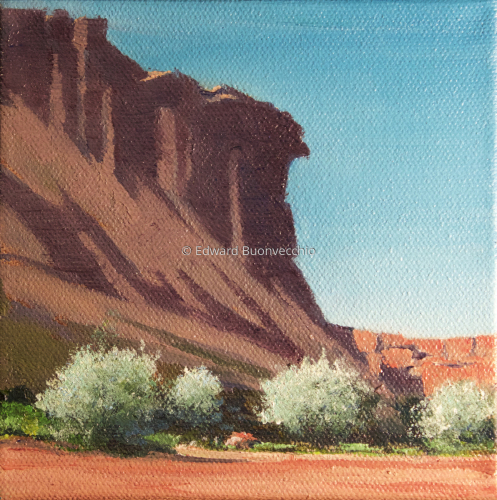 This series was painted in September of 2012 during a workshop with Linda Glover Gootch given through the Scottsdale Artists School and the Grand Canyon Field Institute. I am in awe of how atmosphere changes the color of the earth and the stratified layers of the Grand Canyon show this like no other place on Earth. 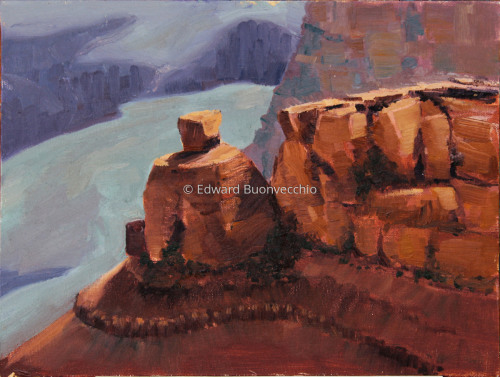 My series of South Rim plein air oil paintings show this as best I can paint. 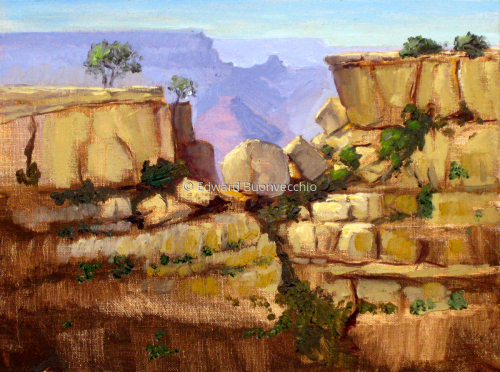 This series was painted in September of 2012 during a workshop with Linda Glover Gootch given through the Scottsdale Artists School and the Grand Canyon Field Institute. 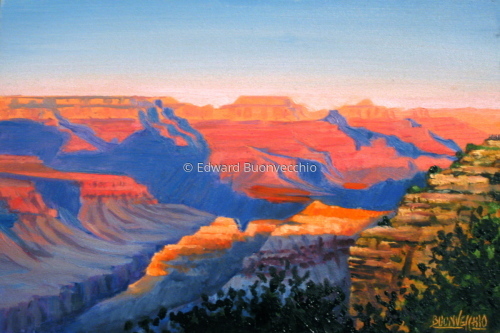 Working from a photograph from one of my many trips to the South Rim I managed to capture the essence of the warm light and deep cool shadows of a Grand Canyon sunset. I am in awe of how atmosphere changes the color of the earth. The stratified layers of the Grand Canyon show this like no other place on Earth. 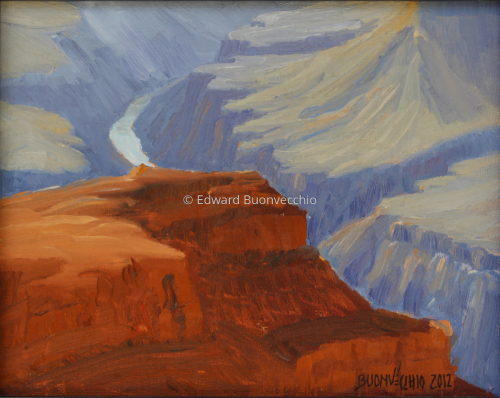 My series of South Rim plein air oil paintings show this as best I can paint. 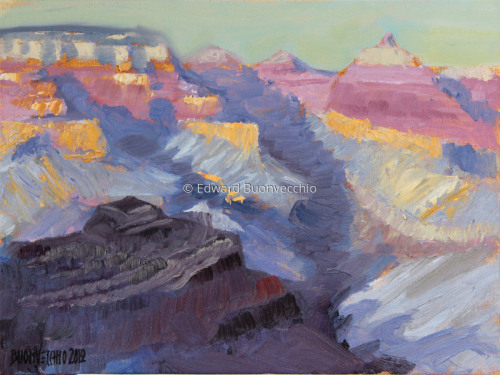 This is one in a series painted in September of 2012 during a workshop with Linda Glover Gootch given through the Scottsdale Artists School and the Grand Canyon Field Institute. This is a painting of a photo during our tour of the canyon where we saw the famous White house ruins built and inhabited by the Puebloan people. The sand stone cliffs were majestic and nestled sparsely at the base were Hopi, houses, trees and small fields of crops and farm animals. I stylized the shadows of the cliffs, a la Maynard Dixon...kinda! oil on stretched canvas. 5" x 5" x 1 3/8"
This is my tenth painting for the 30 in 30 challenge, oil on watercolor paper. 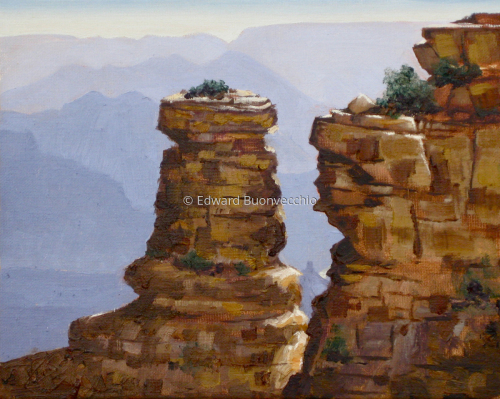 This is a studio painting from a photo i shot on one of our many trips to the South Rim of the Grand Canyon. Lookout Studio was designed by architect Mary Colter to emulate the natural scenery along the rim of the Grand Canyon using local stone and wood while mimicking 12th Century southwestern Native American construction styles. I have always loved the look of this profile while walking along the rim path from Bright Angel Trailhead and vowed to paint it one day. Oil on Panel, 8"x10". During my week-long camping and painting adventure in the Grand Canyon in April of 2015, I was faced with below normal temperatures with rain and snow. My last day was the best at Moran Point! The reds and pinks in the canyon brought out the stunning blue green of the Colorado below! 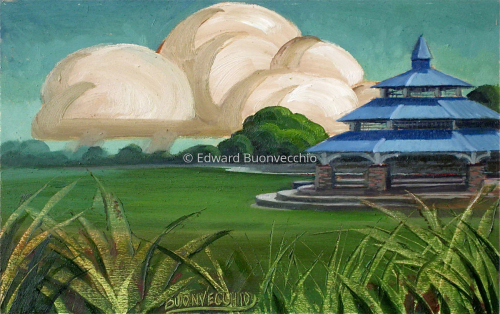 This painting was finished in the studio. There I met New Hampshire plein air artist Beaman Cole, whose wife was recovering from a broken foot in a Flagstaff hospital the first day of their vacation. Mormon Row is a line of homestead complexes along the Jackson-Moran Road near the southeast corner of Grand Teton National Park, in the valley of Jackson Hole. The Mormons began arriving in the 1890's and the barns and homes have been abandoned since 1960. 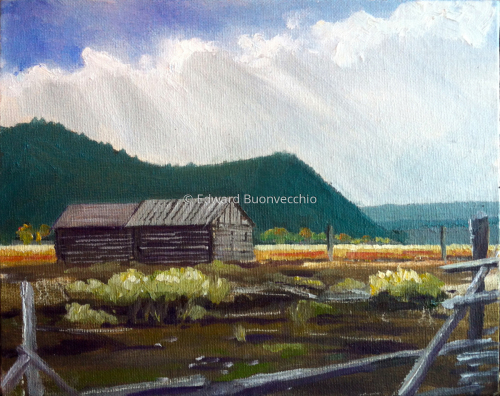 I painted this on a cold fall day when the clouds hid the spectacular Teton Range rising in the background. Oil on Panel, 9x12. Most days during my April, 2015 stay at the South Rim of the Grand Canyon I was met with cold, rain, snow and wind. But once in a while it was glorious, like this view at Mather Point! This was painted mostly on the rim, but finished in the studio. 8"x10" Oil on panel, Sedona Arizona. 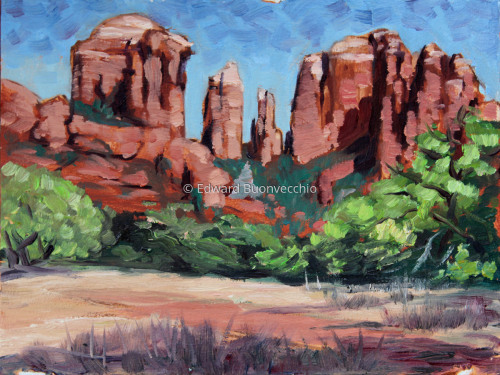 I got up early one morning in Sedona this past April and hiked to Coffee Pot rock with my paint box. But before I got there I found this great sight just to the west of the "Rock." 8x10 oil on panel with 3" oak frame. It was sold in November at a Funraising Auction and Gala benefitting Banner/Cardon Children's Medical Center in Mesa, Arizona. I will never tire of the raw beauty and color of this landscape.